Incredible. The first week of guided trips has been nothing short of spectacular, and I must say the fishing has been better than last spring's trips. The numbers are great (20-60 per day) and the average size of the fish remains over twenty two inches. Lots of fish over twenty four, a handful in the thirty inch range! We had a dose of nasty weather to contend with for two days complete with snow, wind, and a 55 gallon drum of cold poured all over us but it did not stop the big cutts from coming to the net. The weather overall has been excellent once again for March. We have only a few days left to book for all of March, April, and May. The limited open dates are posted on the Pyramid calendar. We are doing single day guide trips this year. 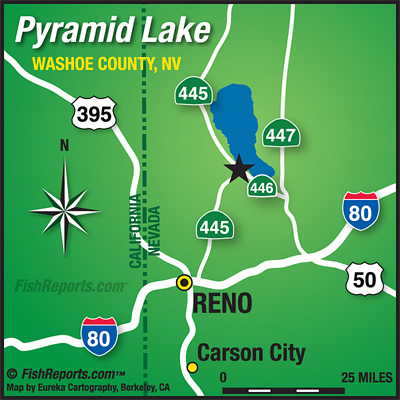 Pyramid is an incredible fishery and if you are looking for a trophy trout on the fly this is the place. I hope to fish with you soon.